An argument that I’ve been seeing a lot is that disruptive protest is wrong because it causes negative effects for innocent bystanders. I do think that for both ethical and strategic reasons, it’s important for protesters to balance the potential usefulness of what they’re doing with the risks posed to others – to not lose sight of the potential consequences of an action for other human beings. But let’s look at what people are actually saying when they say that protests are automatically bad, discredited, if they have negative impacts on others. Let’s look at what they’re actually saying when they say that if you protest in these disruptive ways, you’re just hurting the cause, because people will be angry and alienated. Let’s look at it through the lens of the movement that US protesters are so often told to emulate – the Civil Rights Movement. There are a number of Civil Rights Movement actions that we could look at. 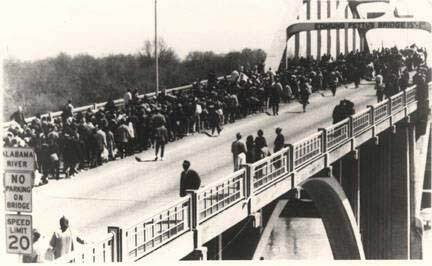 Selma-to-Montgomery marchers blocked (at different times, either part or all of) the US-80 highway with their marches. 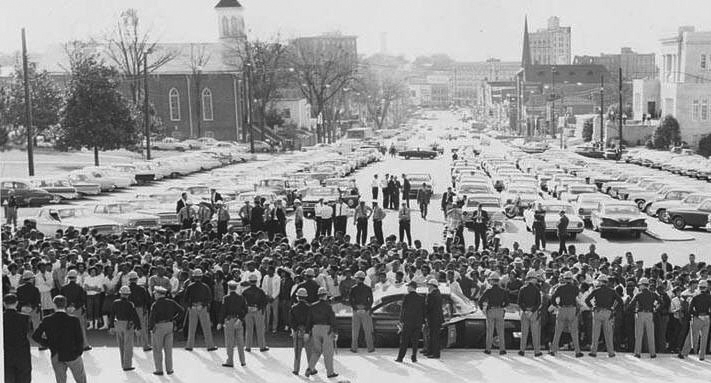 Several hundred students and others, marching to the State Capitol in Montgomery in response to violence against the Selma protesters, marched in the street and were surrounded by the police (who eventually attacked them), causing a road to be blocked, as you can see in this photo. 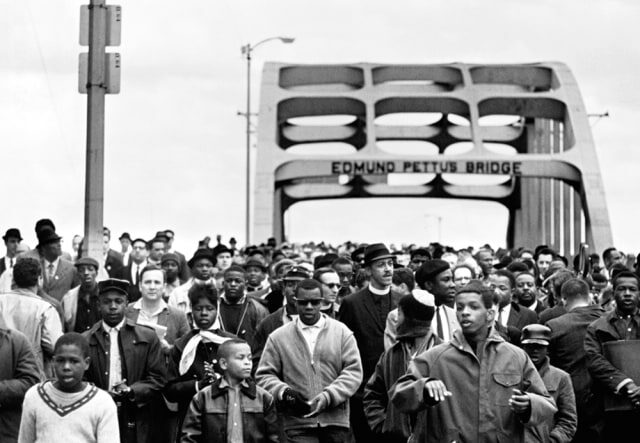 And according to Gary May’s Bending Toward Justice: The Voting Rights Act and the Transformation of American Democracy, 400 people blocked the entrances and exits of the Los Angeles Federal Building in solidarity with the Selma protesters. Are we really meant to believe that repeatedly blocking a highway, blocking a main road in Montgomery, and stopping people from entering a federal building – all part of the campaign, now recognized as heroic, that won the Voting Rights Act – gave no inconvenience to innocent bystanders, caused no emergency or other important vehicles to have to find another route or be delayed, had no negative effects? However, I don’t think any of those are the best examples to look at when it comes to the question of negative impacts on bystanders. Let’s look at the Montgomery Bus Boycott, the celebrated and legendary campaign kicked off by Rosa Parks’ arrest for refusing to give up a bus seat, that brought Martin Luther King Jr into the national public eye and was the seminal event for a major wave of civil rights activism. Within roughly a month of the boycott starting, it resulted in bus company losses of $0.22/mile, throwing it into serious financial trouble. The company cut back on service, reducing total miles traveled each day by 31%. Eight bus lines were completely discontinued (see link in next paragraph), and others were rerouted, with most service to black people and quite a bit of service to white people being dropped. The company was struggling so much that, as you can read at that 1956 New York Times article I linked to at the start of this paragraph, fares were raised by 50%, and a new transfer fee equivalent to a full 50% of the old adult fare was added, such that poor and working-class people of all races who depended on the bus to get to their jobs, the grocery store, medical care, shopping, suddenly found it unaffordable. By the end of the boycott, not only was the bus company brought nearly to bankruptcy, but the city lost thousands of dollars in tax revenue – tax revenue that, as in any city, paid for essential services for the whole population – and local businesses lost millions of dollars. The boycott had a devastating effect on the rank-and-file employees of the bus company – not only drivers, who were working people simply enforcing the rules that they were told to enforce, but mechanics/handymen and lower-level workers, who hadn’t been enforcing those rules at all. In the first round of layoffs, which came with the first set of service cuts, 39 drivers lost their jobs. As the boycott went on, the bus company workers suffered mass layoffs (including the layoffs of the few black workers, none of whom were drivers). Some drivers avoided job loss by taking demotions to menial work, but many more were put out of work completely. As you might imagine, many Montgomery-area locals, especially white ones, were upset about this disruption to their lives. White elders and other white residents wrote letters to the local paper speaking about the inconveniences they faced as a result of the service cuts. Boycott opponents felt that they had the moral high ground because of the negative impact of the boycott on so many people, and that the protesters had gone too far. Other letter-writers characterized the protest as a group of reasonable people co-opted by a small number of radicals (which sounds oddly familiar right now, somehow), or acknowledged that there might be a point to the cause but complained that illegal protests wouldn’t help. I’ve been asked, regarding protests that block traffic, what did all those people who now can’t get to work or school on time, or miss their flights, or were just trying to get to appointments, do to deserve that. Well, what did the random citizens of Montgomery, the ordinary non-policy-setting people who bore the brunt of the negative impact, the transit workers and their families, and the bus-taking elders, and the employees of the local businesses that lost millions of dollars, and the people of all races whose commuting routes were cut or who could no longer afford the bus fare, do to deserve that? Does it make one of the US’ most famous and celebrating protests wrong, that that happened? I acknowledged previously that disruptive protest risks causing a backlash. And I’ve certainly been hearing a lot about how various anti-racist-policing/Black Lives Matter protests are hurting the cause because they will cause (or are already causing) such a terrible backlash! So what sort of backlash was caused by the Montgomery Bus Boycott? Local backlash, especially from working-class white people (including the laid-off bus drivers) was so severe, that roughly two months into the boycott, the local White Citizens Council (WCCs were pro-segregration white supremacist groups, called “the uptown Klan” by Thurgood Marhsall) was the largest white group in the area. Over the course of the boycott its ranks doubled, and it was able to draw over 10,000 people to its events. And the city commission received “hundreds” of messages applauding them for taking a hard line against the boycott, as the commissioner accused boycotters of trying to “destroy our transportation system.” Backlash, even the angriest backlash, doesn’t necessarily mean you’ll lose in the end. Do I like that a lot of social change work in the streets causes problems for random people? No, I don’t. Am I endorsing an “anything goes because the end justifies the means” approach to tactics? Nope. I actually have pretty strong negative views about certain kinds of tactics, and as I said, people should think through both the ethics and the strategy of their tactics. I don’t think people should risk harm to others wantonly. I have sympathy for people who are severely inconvenienced, and I especially am not happy when the negative effects hit people who are already struggling or marginalized. But I don’t think there’s a bright line at “inconveniences other people,” or even “is disruptive to the lives of other people.” I don’t think there’s a bright line there because history shows that if you draw the bright line there, you effectively shut down social change. If you want to argue that the black voting rights activists, or the Montgomery Bus Boycott activists, were justified in the level of disruption that they caused, but that modern activists in various movements aren’t justified because their causes aren’t just enough to warrant it, that’s an argument you can make. But then you’re arguing substance, not tactics, and in that case you should stop pretending to argue tactics. If you truly believe that any protest that might have a negative impact on others is wrong, that it’s never justified, that’s also an argument you can make. In fact, I think that’s a coherent ethical position! But if that’s the position you’re taking, you need to understand the implications of that position. If that’s the position you’re taking, then you should believe that the Selma campaign and especially the Montgomery Bus Boycott were wrong. You should believe that the gains they made weren’t worth it. You should shake your head at positive reviews of the Selma movie. When your kids learn about MLK and Rosa Parks and the Civil Rights Movement in school, you should teach your kids that whatever the benefits of their actions, they were doing unethical things that hurt innocent people, and that your kids should never be part of something like that. Because that is what that position means in real life. That is literally what it means to say that disruption and inconvenience discredit activism. While you do that, I’ll be over there with the people trying to make the world a more just place, negotiating and balancing the ethics of doing so the best they can.